Mexico, Chile, Peru and Colombia met on the 16th of December to solidify an economic alliance initiated by Alan García Pérez, the former president of Peru. In the interest of greater integration between the four countries, The Pacific Alliance (Alianza del Pacífico) has solidified bilateral trade agreements to facilitate and foment trade between the countries in addition to driving initiatives with the intention of expanding westward toward the Pacific and Asia. It is anticipated that Panama, which was initially invited to join the group, will join sometime in 2012 bringing the total number of countries to 5. Excluded from the powerful Mercosur trade block, the recent implementation of The Pacific Alliance provides an economic counterweight to the 17 year old Mercosur which is represented by Argentina, Brazil, Paraguay and Uruguay. 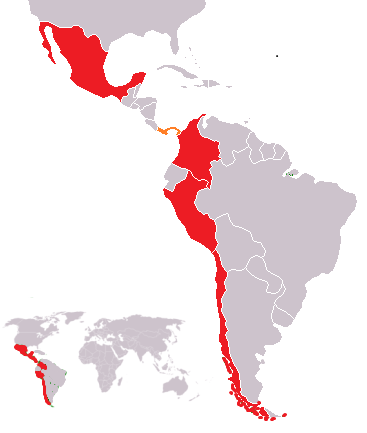 During the initiation of the alliance, Peruvian president Alan García claimed that The Pacific Alliance represents the economic might of more than 200 million inhabitants (compared to roughly 270 million represented by Mercosur), and 55% of the exports of Latin America through the economies of Mexico, Chile, Peru, Colombia, and the forthcoming Panama. Good to see that the more sensible countries are trying to strengthen each other.